Past Tense in the Rusyn Dialect of Novoselycja: Auxiliary vs.
Abstract: This article discusses the choice of the past-tense forms in the Rusyn dialect spoken in the village of Novoselycja in Zakarpats’ka oblast’ of Ukraine. The past- tense forms for the 1st and 2nd person in Rusyn are formed by a participle accompa- nied either by an enclitic auxiliary or by a fully stressed subject pronoun (the former construction occurs more often), but not by both. The factors in uencing the choice of one over the other have never been clear. I claim that in Novoselycja Rusyn the factor that in uences the choice of an auxiliary or a subject pronoun is a discourse factor. The choice between auxiliaries and pronouns generally depends on the position in discourse: the pronoun codes the rst mention of the 1st and 2nd person subject and the auxiliary subsequent mentions. The exceptions, auxiliaries in locally initial posi- tions and pronouns in locally subsequent positions, show dependence on the speech genre: speakers prefer pronouns at the beginning of episodes in classical narratives, and auxiliaries in genres closer to interactional conversation. 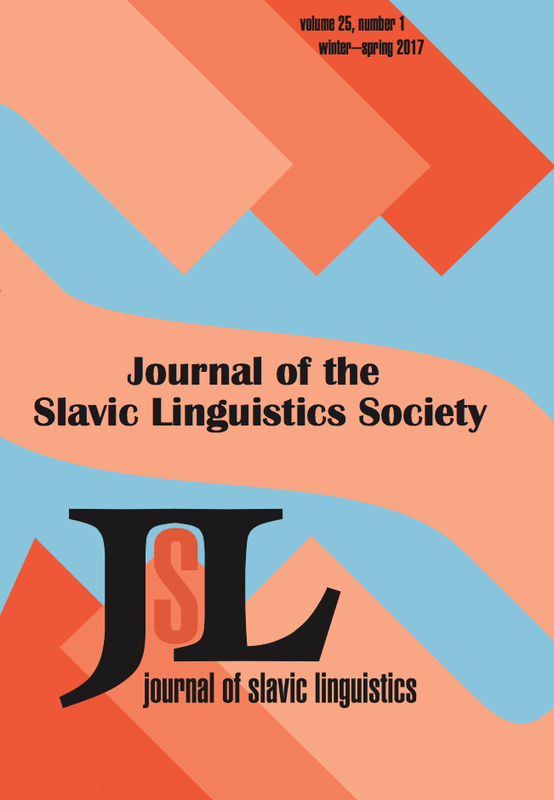 Abstract: The preservation of length in the West Slavic and South-West Slavic genitive-locative dual in *-ū is unexpected and to date unexplained. BCS rùkū ‘handsGEN.PL’ is likely to continue a trisyllabic preform. At the same time, Indo-Iranian and Greek o er strong evidence for PIE o-stem and ā-stem archetypes that should have yielded late Proto-Slavic and OCS *-oju (thus, OCS *ro ̨koju), rather than *-u. The actually a ested OCS form is ro ̨ku. The present study seeks to provide a uni ed ac- count of these two problems. The development of some of the PIE dual endings in other daughter traditions, including Greek and its dialects, is also addressed. Abstract: This paper discusses the problem of resumptive pronouns in Polish object relative clauses introduced by the relative marker co. It does so through the use of corpus data, thus contributing to previous literature, which has been largely based on introspection. In the literature, di erent accounts vary signi cantly as to the basic question of when the resumptive pronoun is expected. The present study addresses this ma er by means of qualitative and quantitative analysis of conversational spo- ken Polish—the language variety in which co relatives typically occur. As is shown, the relatives are used in two broad con gurations—unmarked (with null resumptives and inanimate referents) and marked (with overt resumptives and human referents). Both scenarios are linked to distinct strategies of case recovery. The presence of the pronoun itself is one such strategy. In contrast, the omission of the pronoun is of- ten accompanied by case-matching e ects that facilitate the omission. Another typ- ical property of co relatives is their preference for encoding de niteness of referents, whereby kt ry clauses tend to signal inde niteness. This is evidenced by the frequent cooccurrence of co clauses with head-internal demonstratives. Interestingly, these head-internal demonstratives can also render resumptive pronouns unnecessary, thus constituting another factor relevant in resumption.